Get a taste of how royalty has lived throughout the ages with a visit to the Queen’s official residence in Edinburgh. We review what's on offer for children and families. Delve into the history of the Royal Family behind the doors of the Palace of Holyroodhouse. Lucy Dimbylow visited with her children Katie, six, and Tom, 11. Situated at the end of the famous Royal Mile, the Palace of Holyroodhouse is the Queen's official residence in Edinburgh. It’s where she bestows honours upon her Scottish subjects and hosts her annual garden party. Over the centuries, the Palace has been home to many famous (and infamous) kings and queens, including Kings James II, III, IV and V, Bonnie Prince Charlie and Mary, Queen of Scots. The visit takes in the State Apartments, Mary, Queen of Scots’ Chambers and the abbey ruins, and is a fascinating look at how the Royal Family has lived through the ages. 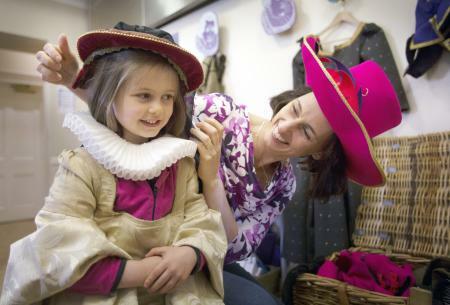 There’s a dedicated family room at the Palace with lots for younger children to do, including period dressing-up costumes, traditional games like quoits, and a range of books, drawing activities and worksheets. Be aware that the family room is situated at the end of the tour. We didn’t realise this at the time, but would strongly recommend nipping in before you start to make your way around the Palace so you can pick up activity sheets to fill in as you go round. Year 2 Katie felt very grown-up, working her way around the Palace with the audio tour (handheld devices with headphones) that’s included in the admission fee. She also enjoyed filling in the activity trail, thinking about who she’d invite to a State banquet and looking for details in the Palace’s tapestries and paintings, and was fascinated to see where the Queen eats her dinner. Visiting the Palace of Holyroodhouse helped to bring history to life for 11-year-old Tom, who’d heard of characters like Mary, Queen of Scots and Bonnie Prince Charlie but didn’t know much about them. He particularly like hearing about the bloodthirstiness of various battles. The audio tour was a great way to pace our visit, making sure we stopped to take in the history and detail of each room, rather than racing towards the end, and our children definitely absorbed more information than they usually would when visiting an historic venue. The Family Garden Trail and Family Abbey Trail: these worksheets include spotters’ tasks, drawing activities, puzzles and more, and can be collected from the family room (at the end of the Palace tour, before you venture in the grounds and abbey ruins) or downloaded before your visit. There are various seasonal events with a family-friendly flavour. 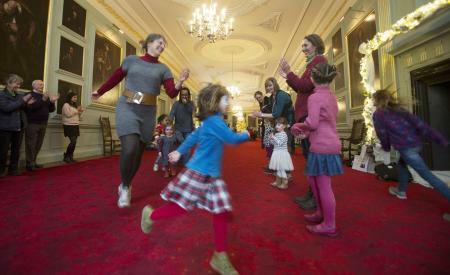 Visit at Christmas to see the Palace bedecked in decorations, and take part in activities such as face-painting, story-telling and ceilidh dancing. 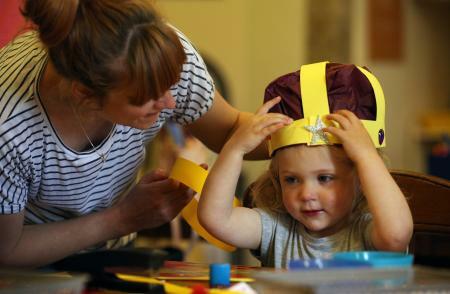 There are also half-term events, with attractions like writing a letter with pen and ink and sealing it with the Royal crest. The occasional family Recitals for Wrigglers, intended for children aged four and under, are great for giving your child an early introduction to history and music. The Café at the Palace in the Mews Courtyard serves light lunches, cakes and hot and cold drinks. Food and drink are strictly prohibited in the Palace, but there are benches for picnicking in the grounds. The Palace of Holyroodhouse, Canongate, The Royal Mile, Edinburgh, EH8 8DX. The Palace is a 15-minute walk from Waverley Station. Public and open-top tour buses stop nearby, and there’s a public car park next to the Palace. Adults £12.50, under-fives free, children aged five to 17 £7.50, family tickets (two adults and three children) £32.50. Prices are due to increase in 2018. The gift shop has a range of souvenirs priced £1 to £5. We liked the ornate crown pin badges, and the wide selection of children’s books including colouring books and stories based on the Palace’s history. There are great online activities to download, including Design a Cypher, Design a Coat of Arms, and Make a Miniature, plus an interactive map with fun facts for your child to discover. Understanding the history of the British Isles.